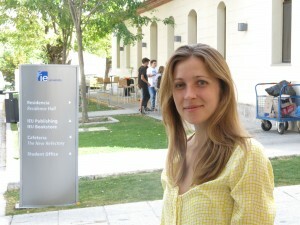 IE Humanities Center is pleased to congratulate Amanda Dennis, who will be the 2013-2014 IE- Berkeley International Postdoctoral Teaching Fellow. Amanda M. Dennis earns her PhD in Rhetoric from the University of California, Berkeley, where she focused on the relationship between twentieth-century French philosophy and the work of Samuel Beckett. She is currently revising her dissertation into a book, Bodying Space, which emphasizes the importance of the body to postwar French thought and to Beckett’s prose, theater and television work. She has taught courses on modernist literature, ethics and subjectivity in England, France and the US. Besides teaching in the Humanities program Amanda Dennis will also take part in the campus life participating in lectures and extracurricular activities.